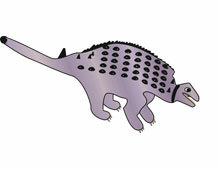 With all of its heavy armor and thick bones, Euoplocephalus seems like it would be slow and clumsy. Quite the contrary. Because its armor plating developed in narrow bands, Euoplocephalus was quite agile for a dinosaur of its size and mass. Living up to the end of the Cretaceous Period, Euoplocephalus was one of the largest of the armored dinosaurs known as ankylosaurs. It weighed close to two tons and measured 18 feet in length. Bands of armor were embedded in its back and covered with large, bony knobs. There were also pointed spikes at the back of its head, over its shoulders and at the base of its tail. Like its close relative Ankylosaurus, even its eyelids were armored with bony plates that slid down to protect the eye socket when the dinosaur was in combat.. In combat, Euoplocephalus must have been quite a fighter. Even its natural enemy, the powerful Tyrannosaurus, would have had a tough time breaking through Euoplocephalus' heavy body armor. Meanwhile, Euoplocephalus would try to scramble around until it could swing the massive bony club at the end of its tail toward Tyrannosaurus' legs and stomach. A direct hit might have been fatal.